Awarded Truck Trend’s 2017 Pickup Truck of the Year, the 2017 Nissan Titan has been a huge success. Some prefer the heft of the 2017 Titan XD, but some are looking for a high-performance pickup with less bulk. At Speedcraft Nissan in West Warwick, we’re finding the XD is popular with buyers who want a full-size pickup that outpaces its competition, but some don’t need to tow 12,000 pounds and are looking for more maneuverability. Both Titan and Titan XD feature a new Endurance V8 engine, although the Cummins Turbo Diesel engine is not offered on the standard Titan. The 5.6L Endurance V8 produces an impressive 390 horsepower and is matched with a seven-speed automatic transmission. Staff at Truck Trend say that combination made it one of the quickest production pickups their experts have ever tested. Truck Trend, an offshoot of Motor Trend magazine, was so impressed with the Titan that it named it the Truck Trend 2017 Pickup Truck of the Year. Capable, practical and comfortable – that’s what made the Titans rise to the top. Both are four-door vehicles that seat six. The 2017 Titan is the same width as the XD at 79.5 inches, but its wheelbase is one foot shorter, and nearly 15 inches have been cut from the length. To compare maximum payload, the Titan’s is up to 1,950 and the Titan XD capacity is up to 2,910 pounds. The Titan’s maximum towing capacity is 9,740 pounds, which is powerful enough to pull a livestock trailer and two steer, but the Titan XD, as previously noted, can pull an even heavier load. The XD also features a reinforced, fully boxed, full-length ladder frame and huge, heavy-duty 14-inch brakes. 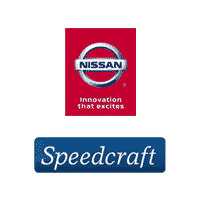 Friendly staff at Speedcraft Nissan will be happy to answer any questions about the Titans, America’s fastest growing full-size truck brand.